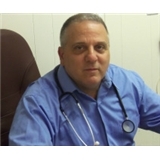 Anthony G. Ciccaglione, M.D. (Milford) - Book Appointment Online! Primary Care Physician, Board Certified, Internal Medicine. In Private practice since 1987. Graduate of UCONN Medical School; Internship/Residency @ St. Vincent's Hospital, NYC. Attending physician, St. Vincent's Medical Center, Bridgeport, CT. Specialty areas: Hypertension, Diabetes, Cholesterol Management, Men's Health. Employee, School, and Sports Physical Exams available.